Reflections on Wine: It's Time for Albariño! August 1 is Albariño day. There's something I bet you didn't know - I didn't until a few weeks ago. I always thought it strange that there would be a special day for a particular wine - why not a week or a month? I'm not going to drink it only on that day; regardless, at least this business about a special day gets us thinking about Albariño- and that's a good thing. Albariño is a dry white that is becoming ever more popular in America; certainly the public is moving away from big reds, preferring more elegant, drinkable wines and Albariño is there to fit the bill. The fact that it's a lovely aromatic wine with delicious fresh fruit is also a big plus - here is a wine that is a crowd pleaser and one that can be paired with gourmet fare. 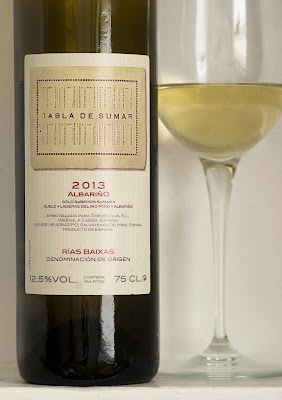 Albariño is a dry white made from the eponymous grape grown in the Rias Baixas region of northwest Spain, not far from the border with Portugal (there are also some excellent versions of Albariño produced in Portugal, but for this post, we'll only deal with those from Spain). This is a continental climate, with the advantage of being located not far from the Atlantic Ocean, meaning that local vineyards receive cooling breezes from the sea, moderating temperatures. This helps preserve freshness and acidity, which make this an ideal region for the Albariño variety. In fact, 90% of the plantings in Rias Baixas are Albariño. This means dozens and dozens of producers craft their version of Albariño. I've enjoyed these wines for years; Albariño has become one of my favorite summer whites, although I enjoy it in the spring and autumn as well. Most are unoaked, letting the pear, melon and apple fruit aromas shine through; they're ideal paired with shellfish (paella would be a great match), risotto and lighter vegetables such as carrots and peas. I also love taking an Albariño to a BYOB Thai restaurant here in Chicago - they are especially great with spring rolls, noodles or chicken or pork with lime and peanut sauce.